Assassin's Creed: Syndicate - Complete walkthrough with general advice on all memories, sequences and all collectible items including beer, flowers and more. We accompany you with our guide to the new Assassin adventure through London and offer you all the location of collectibles. 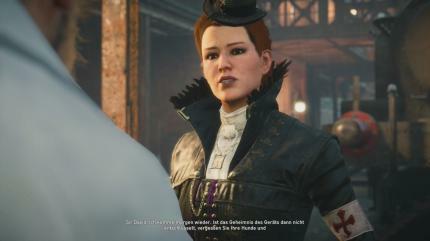 In the first sequence of Assassin's Creed Syndicate you come with the Frye twins (Evie and Jacob) to London. A worried Assassin calls both in the occupied city, to free them with common power of the Templars. They have the grandmaster Star Rick a man at the top, the same few scruples as enemies in the city. First you have to get to grapple in the steelworks with the two industrialists: Rupert Ferris and David Brewster. You slip into the shoe of Jacob after the intron sequence, who has gained access to the factory. Now it is your task to find Ferris. Familiarize with the control and jumps quick foot to the destination point at the end of the hall. The door is locked, of course. You only open when there is a problem. You must now sabotage the machines. Sprint per course run back up and interact with the wheel. The same repeated at the wheel above and on the other side of the hall. Now you have the guards called into action. Complete the first by air attack and then those remain outside. In the ensuing battle, you learned how their strokes distributed, counters and the defense of the enemy break through. After you eliminate the minions, go on to the red target. Behind you are on the front part of the factory site. Climb one side of the plant up to get an overview. The crane is your goal. From there you can by trail back down. Here you learn more about the attention of the guards and how they detect you. Now continue to the destination point and try to get past the guards without conflict. Use the height advantage to escape them. The same is true at the end of the path in the big hall. Climb one of the pillars to the top and look for the door on the left. Here you sneak subsequently and duck and go past the first guard, once he turns away. Then climb behind him on the bar above the space and can see the situation. At one point near the wall you let yourself being seen falling down and set the path continues. In train depot more children are forced to work. Continue towards goal by exploit the bar. Ferris is to be found in his office at the large furnace. Climb up on the left down and always keep on this path until you meet a guard behind a few workers. Take them out silently by killing and then go into the next room. The main entrance to the office is highly secured. Therefore, continue left and wait until the guard in the middle of the room turns before you go to the stairs. Climb to the roof of the small room and the wooden board on the other side. From there you reach the roof of the office. Go inside. From the beams you can now take the industrialists. Your first step in the fight for London is done. About the back room you can now also escape unseen. On the train you just have to take care of the guards. You successfully complete the first sequence of Assassin's Creed Syndicate. Continue with Evie Fry, who seeks at the same time after the life of David Brewster. She suspects the Pieces of Eden in his laboratory. Whistle from cover to attract the guard to you and then get rid of him. You can also take the second guard with a targeted knife throw. Then proceed before the train reaches the goal. The opponents on the way to the cab should not be a big problem. In one of the cars you can find more darts. Front arrived, then coupled from the rest of the cars. Once you have arrived, you have to make to the viewpoint. It's best to excite to get as little attention as the guards patrolling here in large numbers. Wait until the first squad to you is over and then go to the car left. Behind you have enough coverage to get a whole lot towards the crane. At the end of wagon you climb on the coal, and go from there slowly to lift the crane. From the top you have a good overview of the situation. You discover Lucy Thorne and your destination in the depot. With eagle eye you see important items. Jump proper style in the haystack among you and assassinate the first guard, as soon as they come to you too close. Climb out on the opposite side from the pile and go to the building. Jump from above to the police station and then go to the barrels in which to wait another henchmen. Climb back up to the first large hall. Since there are no guards, you do so a few yards to the goal well. On the other side you come even further to the top where you can see some drums again. Sneak to the right through the gears and handle the guards there, before you throw a knife on the ropes. You take these opponents then also the challenge in this memory. Then proceed in the direction of the wood stand and the main building on the other side. Here you should already be drawn in the input. Kill the guard and then go inside. Above is the better way to penetrate. Then go upstairs along the Ganges right to the destination point. Grab the chest in the next room and then go up the stairs to talk to the prisoner. He is being interrogated. Take a smoke bomb, throw them and then turns off his captors. Now you are allowed to ask him yourself. A guard has the key to the lab. Now your goal is to trace this man. From the skylight above you come very fast to the outside and to the destination point. There are three guards in the camp. Wait until the first goes up and then go to the security guard with keys. It's best to go for it with the wagon in the center. Again, you wait until the way is clear, and then strike. With nimble fingers, the key is your fast. Abandon the camp again on the same path and continue to look for the entrance to the laboratory. The easiest access is located at the end of the track hall. Search for the hole in the wooden shed and jump down. Then go to the other side of the tunnel back to the top and to the right. The guard is protecting the desired door. Distract him by whistling. Now activate the elevator to go down. You are brought closer now to the skills upgrades. Learn the double assassination of Evie and take the guards from the same time. The same repeated at the following stations. Now you follow the tube and the water until you discover the lab along with target and Pieces of Eden. Then jump in the next room on the lamp and quickly on to the steel beams. Go to the other end of the room. Here you will do the next guard and then go to the right. Climb on the shelf upward and follow the railing until you arrive directly from Brewster. Beat him by air attack in order to complete the second challenge. Since the Eden Splitter now put the laboratory in ruin, you must escape. Sprint down the hallway and then you find yourself in a small cave again. Squeeze through the gap and follow the path to freedom. Now you complete the second sequence of Assassin's Creed Syndicate. Evie and Jacob meet again with their contact man. The two sisters want to finally advance to London to stop the Templars. So the two make up their orders and travel to the capital. Once there, they initially meet Henry Green in Whitechapel. Earlier Jacob was robbed. Track the boy down the streets. You fall into an ambush. Make short work with the attackers and go with Evie. They challenge you to a race to the viewpoint. To win, you have to use the elevator to the tower. Now Henry appears. After the cutscene you climb up the tower and match the opponents. Thus you experience, what horrors wait in Whitechapel. Follow Henry after the jump down through the town. To keep the ensuing Blighters of Henry's store, Jacob and Evie have to play the decoy. Climb onto the coach and ram the other side. Once you have done all the cars, you can go to the store. Your first step on the way is the support of the London police and child gangs. The leader of Whitchapel called Kaylock is your first major goal. After the cutscene, it is your goal to conquer the district. To achieve this, you must take the Templer, dug a quarter and fulfill two missions at the local gangs. It is located in the east of Whitechapel. The leader of the gang of children want you do a favor before she works with you. You shall liberate children from the factories around. Make your way after talking to the warehouse. So that you trigger an alarm, you should rush to the Blighter and destroy the bell. Then you stay on the corner of the entrance and attract the guard to you. If you turned off, you go inside and keep you on the right. So you come to the other side, you can do the guard, release the first child and destroy the bell. The leader is at the top. Kill him to rescue all the other. Now go up the stairs and eliminate the guard there if he turns you back. Alternatively, you ignore him and instead go up. Then to the left when the guard looks away. So you jump at the end of the camp to the other side and wait there until the leader comes in your vicinity. Take him with the pipe. The sergeant of Whitechapel can help with Kaylock. To him you shall arrested gang members and brought to him. Of course you need the target alive in the coach to deliver and thereby comply with the law as possible. Abberline wants no corpses in his district. Climb on the roof to make up your target with Eagle Vision. To capture him, you have to come closer to him from behind. Once you have him, lead slowly to him. Every now and again you will need to control him. This reduces the radius in which you will discover. If the target flees, you have to ram him. The gang war takes place at the station of Whitechapel. First you need the minions on the ground to do before you jump up on the train, on which is the leader of Blighters. Thanks to the Rooks of the figh, the train is done quickly. Then run after the departing wagon and climb upwards. Now you're on your own. Complete first Kaylocks henchmen with quick strokes or shots. After that, the big chunks of your turn. You shoot him from a distance. As a reward you'll get both the broken grappling hook and the railroad, which has Kaylock wagered. In addition, you acquire through your victory new racquet for the Rooks. You will meet also on Agnes MacBean. The train serves you now as a mobile headquarters. Henry knows someone who can repair the grappling hook. Then Speak with Agnes on the train. Gather on the income from the safe. Then go to the speed upgrade card and have a look on it. Here you can see all the skills that improve your own: bands and you so confer advantages. Buy the available medicine market upgrade and leave the map. Now you can start again new missions. Now we continue with a mission to Alexander Graham Bell. Make your way to the occupied area and speak with him about the grappling hook. He wants you to install the same with the device the fuse for the telephone line at Big Ben. You control Evie in this mission. The grappling hook is in her bracer. Initially go to the carriage and ride with Bell goal. Now you can use the line launcher to pull you up. Furthermore, a zip line to be created, you can even shimmy along and perpetrate attacks from the air. Go to the destination point and climb there on the first house. In the back you see a sniper on the roof. Make your way by cable launcher to him and then take him before you dedicate yourselves to other things. Now you can stretch across the yard and off a guard at the target by bombing from above, to meet the challenge of a rope. The remaining enemies should be no problem. Kill them and grab the metal from the crates. Then you can call up the menu and preparing produce your first bomb and throwing knives upgrade inventory. Back at the Bell mission is complete. Back on the train you meet Ned Wynert and discuss your next steps. Henry made an overview with all connections and followers. Seek out so your goal, and already you are in the fourth sequence of Assassin's Creed Syndicate.